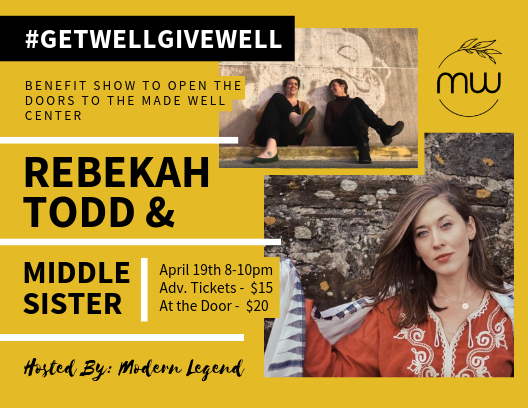 Modern Legend has so generously given us free range of the shop to host The Made Well Center’s first ever BENEFIT CONCERT! Come listen to the soulful sounds of Rebekah Todd (healiner) and Middle Sister (opener) on April 19th, from 8-10pm. Be sure to get your tickets ahead of time, so you are able to actually find some standing room in the shop. Tickets are $15 ahead of time & $20 at the door. Come ready to also shop ’til you drop because Modern Legend has also generously agreed to allow 25% of sales from that night to go towards opening the Made Well Center & starting the scholarship pot for individuals who may not otherwise be able to afford it! Health and wellness should not be a LUXURY but something accessible to all.